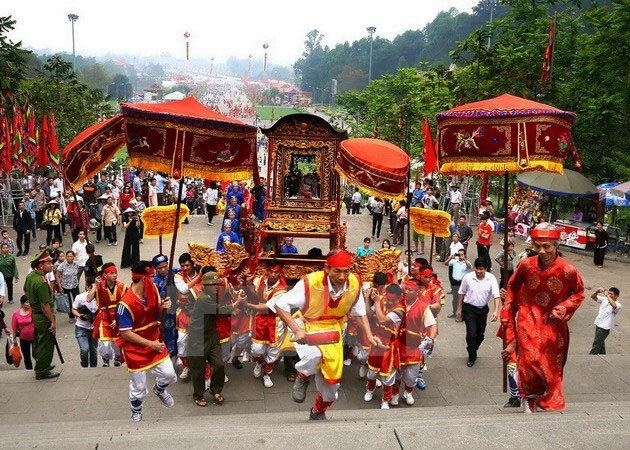 Palanquin procession and offerings rituals were held on April 4 with the participation of five communes in the northern province of Phu Tho to honour the Hung Kings, the legendary founders of the Vietnamese nation. Groups from Chu Hoa, Hung Lo and Kim Duc (Viet Tri city), Tien Kien and Hung Son (Lam Thao district) headed to the Hung Kings Temple on Nghia Linh Mountain. The procession was led by lion dancers, followed by groups carrying national flag and festive flag and another playing ritual drums and gongs. Meanwhile, the next group carried symbolic weapons and parasols, which was followed by mandarin actors and local people. They presented offerings of chung cakes (square glutinous rice cakes), banh day (round glutinous rice cakes) and their local specialties to the Hung Kings at the temple altar. According to the organising board, this is the 7th year the procession took place in communes on the occasion of the death anniversary of the Hung Kings (the 10th day of the third lunar month). This traditional ritual, which has been preserved for thousands of years, features the country’s cultural characteristics and consolidates national solidarity. It also makes contributions to honouring the worshipping rituals of the Hung Kings, which was recognised as UNESCO Intangible Cultural Heritage of Humanity in 2012. The same day, a contest for making banh chung and banh day was organised at the Hung Kings Temple historic relic site, drawing 14 teams from 13 districts, towns and cities. The contest was held annually to show gratitude to Hung Kings for building a sound custom for the nation. Two winners will get the chance to offer their traditional cakes to the Hung Kings on the 10th day of the third lunar month, which falls on April 6 this year. Vietnamese legend has it that Lac Long Quan, son of Kinh Duong Vuong, married Au Co, daughter of King De Lai. Au Co gave birth to a sack containing 100 eggs from which 100 children were born. The couple then decided to separate to populate the land, so half the children followed their mother to the highlands and the rest went with their father to the sea. The first child went with mother Au Co to Phong Chau, now Phu Tho province. He then became King Hung and founded the first nation in the history of Vietnam, Van Lang. Ruling the country for 18 generations, the Hung Kings taught the people how to grow wet rice. They chose Nghia Linh Mountain, the highest in the region, to perform rituals devoted to rice and sun deities to pray for lush crops. To honour the Hung Kings, a complex of temples dedicated to them was built on Nghia Linh Mountain, and the tenth day of the third lunar month serves as their anniversary. The worshipping rituals of the Hung Kings are closely related to the ancestral worship traditions of most Vietnamese families, an important part of people’s spiritual lives./.